VANCOUVER, British Columbia, Sept. 17, 2018 (GLOBE NEWSWIRE) -- Wealth Minerals Ltd. (the “Company” or “Wealth”) - (TSXV: WML; OTCQB: WMLLF; SSE: WMLCL; Frankfurt: EJZN), announces that following up on positive Transient Electromagnetic (“TEM”) and Magnetic Telluric (“MT”) geophysical survey results (see news release December 14, 2017), at the Company’s Atacama Project (the “Project”), Wealth has completed a comprehensive re-interpretation of geophysical data and established a large 100km2 area of anomalous data, interpreted to represent high-salinity brines at depth. 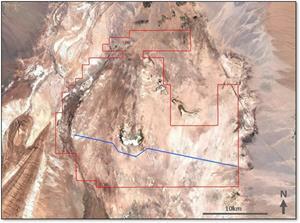 Wealth Atacama Project and location of geophysical survey Line A-I-M. This news release contains forward-looking statements and forward-looking information (collectively, “forward-looking statements”) within the meaning of applicable Canadian and U.S. securities legislation, including the United States Private Securities Litigation Reform Act of 1995. All statements, other than statements of historical fact, included herein including, without limitation, statements regarding the results and expected completion date of the Geophysical Survey, the acquisition of additional properties in the Atacama region, the commencement of drilling at the Project, the discovery and delineation of mineral deposits/resources/reserves on the Project and the anticipated business plans and timing of future activities of the Company, are forward-looking statements. Although the Company believes that such statements are reasonable, it can give no assurance that such expectations will prove to be correct. Forward-looking statements are typically identified by words such as: “believe”, “expect”, “anticipate”, “intend”, “estimate”, “postulate” and similar expressions, or are those, which, by their nature, refer to future events. In making the forward-looking statements in this news release, the Company has applied several material assumptions, including without limitation, that market fundamentals will result in sustained lithium demand and prices, the receipt of any necessary permits, licenses and regulatory and community approvals required for the exploration and development of the Company’s Chilean lithium projects in a timely manner, the availability of financing on suitable terms for the development, construction and continued operation of the Company’s projects, and the Company’s ability to comply with environmental, health and safety laws. The Company cautions investors that any forward-looking statements by the Company are not guarantees of future results or performance, and that actual results may differ materially from those in forward-looking statements as a result of various factors, including, issues raised in respect of the Geophysical Survey, operating and technical difficulties in connection with mineral exploration and development activities at the Company’s projects, including continuing delays in the commencement of drilling at the Project, actual results of exploration activities, the estimation or realization of mineral reserves and mineral resources, the timing and amount of estimated future production, the costs of production, capital expenditures, the costs and timing of the development of new deposits, requirements for additional capital, future prices of lithium and precious metals, changes in general economic conditions, changes in the financial markets and in the demand and market price for commodities, accidents, labour disputes and other risks of the mining industry, delays in obtaining governmental approvals, permits or financing or in the completion of development or construction activities, changes in laws, regulations and policies affecting mining operations, title disputes, the inability of the Company to obtain any necessary permits, consents, approvals or authorizations required, including TSX Venture Exchange acceptance of any current or future property acquisitions or financings and other planned activities, the timing and possible outcome of any pending litigation, environmental issues and liabilities, and risks related to joint venture operations, and other risks and uncertainties disclosed in the Company’s latest interim Management’s Discussion and Analysis and filed with certain securities commissions in Canada. All of the Company’s Canadian public disclosure filings may be accessed via www.sedar.com and readers are urged to review these materials, including the technical reports filed with respect to the Company’s mineral properties.